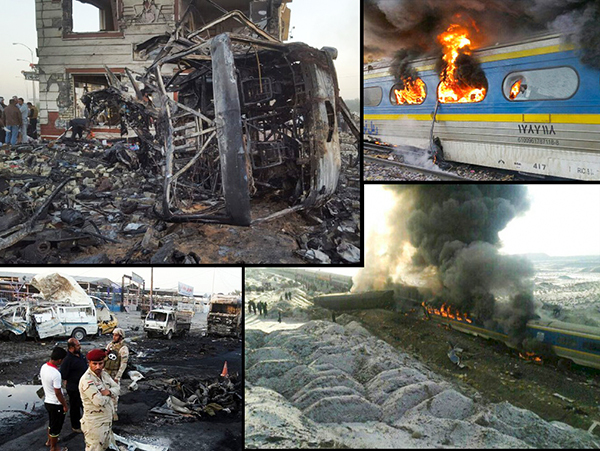 The recent train crash in Iran’s Semnan Province has overshadowed the deaths of dozens of Iran pilgrims in a terrorist attack in Iraq. The train collision in Semnan Province, where President Hassan Rouhani was born, was so tragic that decreased popular attention to the ISIS terrorist attack in Iraq’s Hilla, where dozens of pilgrims including many Iranians were killed. In both incidents, dozens of Iranian people lost their lives. In the Hilla attack, the victims were pilgrims returning from the Iraqi city of Karbala after the mourning ceremony of Arbaeen, the fortieth day after the martyrdom of Imam Hussein, the third Shiite Imam. Similarly in the train collision, the passengers were travelling from the northwestern city of Tabriz to the northeastern holy city of Mashhad, which annually hosts millions of pilgrims visiting the Holy Shrine of Imam Reza, the eighth Shiite Imam. Iranian people, media, and officials paid more attention to the train crash, perhaps because it was totally unexpected. In recent years, Iraq has turned to the land of bad news and ongoing threats; particularly in the time when it was hosting more than 2 million Iranians in Arbaeen processions, the Iranian nation and government was not that much surprised to hear that some 100 people have lost their lives in an ISIS suicide attack. Therefore, it is not surprising to see the tragedy of Iranian pilgrims is somehow overshadowed by the deadly train crash, which was caused by the mismanagement of railway operators and could be easily avoided.